Gulf Breeze Hospital is proud to offer the advanced medical technology and experienced medical specialists often found in larger hospitals, while providing the personalized care of a small, community hospital. We truly offer the best of both worlds. Since when we opened our in 1985, we have made it our Mission to help people throughout life’s journey. This remains our commitment to you today and is reflected in the national quality and safety rankings our team consistently earns. 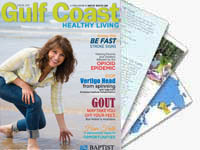 Choose Gulf Breeze Hospital to provide the best possible care for you and your family.